The aim of this web site is to encourage players to share their playing and singing with younger people! Every Nursery Rhyme, Counting Song and little tune only needs, at the very most, THREE CHORDS! Bargain! 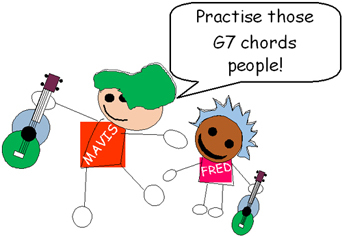 So practise those 'G7' chords and get playing and singing together! 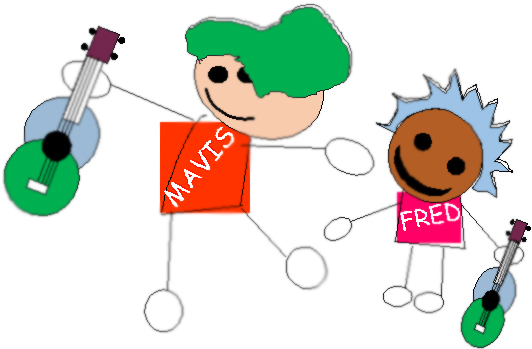 Mavis and Fred will be popping up from time to time to give some helpful tips as well! If you ever see Mavis and Fred singing like this... then click on it as there is an example of the song recorded by some lovely children from All Saints CofE or St. Johns CofE, West Midlands, UK.